This tale of Gabriel Hunt was penned by acclaimed crime, western, and military novelist JAMES REASONER, author of more than 200 books. Reasoner wrote the authoritative 10-volume Civil War Battle series, which supplies some of the historical background for HUNT AT THE WELL OF ETERNITY. 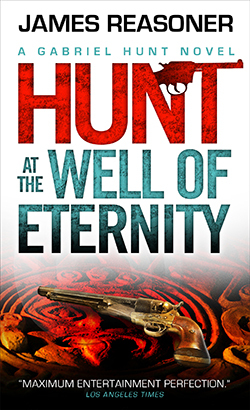 PUBLISHERS WEEKLY gives WELL OF ETERNITY a starred review: "Raises the action bar to nosebleed heights...Pulp adventure fans will be thrilled to see the genre so smashingly resurrected." "The scene is almost mythic...This is the real thing."